Not all debt is created equal. Good debt makes you money – such as a mortgage on an investment property. You’re technically using other people’s money to create wealth through capital growth. On the other hand, bad debt costs you money. Bad debt includes a personal loan for a new car or, worse still, using your credit card to pay for an overseas holiday that you can’t really afford in the first place. It’s a sad fact that many people have no idea how much they spend every month. In fact, many Australians live from one pay period to the next with not much left over before pay day comes around again. 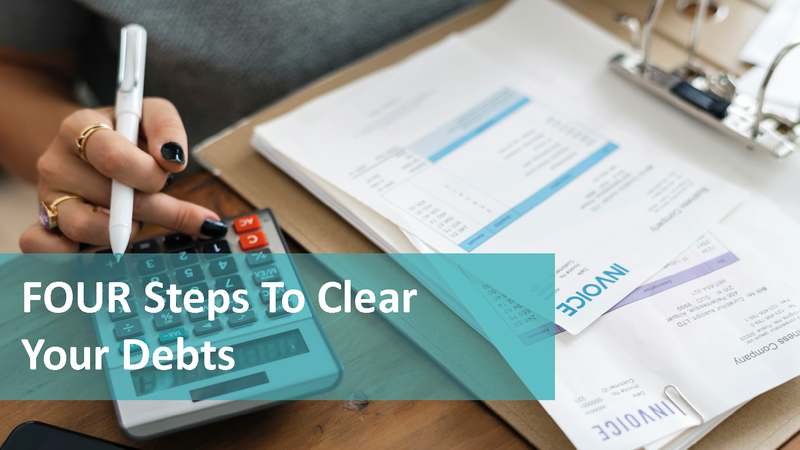 One of the first steps to getting out of debt is to simply track your spending. A good way to do this is to create a spreadsheet or find an app where you can track all of your spending in a month. Here’s a great list of 8 Best Expense Tracker Apps to Use in 2019. Our favourites are Mint and YNAB. If you do this for a month or two, you will soon start to see where all of your money is going. You see, buying your lunch and two coffees every day for $30 soon becomes $150 per week – and before you know it, you’re spending $600 a month! Using the above example, then, another strategy would be to create a budget and stick to it. So, instead of buying lunch every day, try reduce the habit to just once per week – like on Friday’s, as a treat. That way, you’ll save nearly $500 a month, without missing out entirely. No one wants to live on baked beans, though, so it’s important to create a realistic budget. An unnecessarily strict budget is generally doomed to fail from the start. In today’s world of the sharing economy there are a number of ways that you can boost your income. However you choose to create extra income, it’s a sound strategy to increase what’s coming in so you can reduce your debt more quickly. By earning at extra $500 a month you can pay down that personal loan faster, which will allow you to save a deposit for your first home. Again, be realistic about the time that you have available to take on extra work. Reducing debt shouldn’t turn you into a slave to the red numbers while you’re trying to them into black ones instead. There is nothing fundamentally wrong with credit cards – as long as you can pay back the balance in full every month. That way you won’t get stung with sky-high interest rates. Unfortunately, this is the premium you pay for the privilege of using someone else’s (the bank’s) money! The reality is, if you can’t afford to pay off your credit card balance every month, then you can’t afford a credit card. Too many Australians get caught in the debt-trap of paying the minimum off their credit card every month, which means they’ll likely never pay it off. The thing is, you can reduce your debt by preventing it from building it up in the first place. Choose a debit card instead so you’re spending money that you do have, rather than money that you don’t. Saving for a house deposit, but not sure how much you can lend? Audrey from Ash Blue Finances is our trusted, go-to Mortgage Broker. If you’re looking for friendly and expert knowledge, call her for a chat on (08) 9291 4750. She’d be delighted to assist you!